Update : Literally I Can’t – RedFoo to be booted from X Factor? Well – we are certainly off to a great start! Since the petition went live this afternoon, we have seen over 3200 people sign in just a few hours. 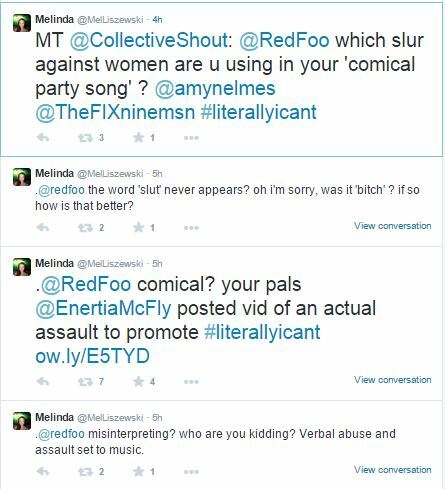 Several media sites have shared the story, condeming RedFoo’s attitudes toward women, while others such as TheFix have gone even further by putting a blanket ban on any future media coverage regarding the ”musician”. The string of support hasn’t been surprising, given RedFoo’s poor response to criticism (in which he claims people are ‘misinterpreting’ his art) and also the shocking fact that Enertia McFly (who also features on ‘Literally I Can’t’) promoted the release of the single by posting video of a woman being assaulted. Although they swiftly removed the video from social media, activist Deb Malcolm was even swifter, getting this screen shot (the image contains a screen grab of a video in which a woman is assaulted by a man with a shovel). AND, just as I am writing this, I received a link to a tweet from Luke Dennehy – claiming that the Foo-meister will not be returning to X Factor next year. I’ll definitely be following this up tomorrrow, but I’m still hopeful that Fremantle Entertainment and Channel 7 will address the issues, and that RedFoo will remove the offensive video/song completely. Preferably, I’d like to see it recede far into the dark, never to surface again!